Donald Trump’s anti-Muslim rhetoricis so popular that the best-known white-supremacist site on the web, Stormfront, says it’s installing new servers to handle all the traffic the Republican presidential front-runner has generated. Talking to Politico, Stormfront founder Don Black said Trump’s campaign had reenergized the white-nationalist movement, and Stormfront has the traffic to prove it. He said Stormfront now sees a million unique visitors a month, and traffic spikes 30 to 40 percent whenever Trump makes a controversial statement about minorities. “Demoralization has been the biggest enemy and Trump is changing all that,” Black said. Even David Duke, infamous racist politician and former Ku Klux Klan figurehead, agrees Trump has been great for racist movements. “He’s made it ok to talk about these incredible concerns of European Americans today,” Duke told Politico. The Southern Poverty Law Center, finding a rare point of agreement with Stormfront, also told Politico that Trump has reenergized hate groups. The civil-rights organization told Politico the bloviating billionaire has been “driving online chatter” among white-power groups. Perhaps more disturbing are the white supremacists who like Trump’s anti-Mexican, anti-Muslim pronouncements, but feel he hasn’t gone far enough. Banning all Muslim immigration to the U.S. sounds great to them, but they worry Trump doesn’t have the dedication to activate the military and follow through with his plan. One of the problems with the social media job sites is that they encourage you to post a picture. People who want to discriminate on age, race, or ethnicity easily can do so. This facilitates job discrimination, which by the statistics is common in a number of industries, and epidemic in terms of age discrimination. I suggest taking down your pic (and let’s not even go into having an open Facebook) to make that discrimination a bit harder, and to eliminate any connection to any group which might identify your ethnicity. It won’t fix the Dayvonwon, and Tramaninanisha problem…But it helps. The other hurdle is the automated resume readers used by recruiters. I worked for GE a number of years ago, where nearly everyone in management went by the title “Manager”. A Manager in GE terms could be a guy who managed 5 floor sweepers in the office at night – or a guy with 28,000 reports and responsibility for a billion dollar manufacturing business. An automated resume checker looking for “keywords” can (and usually does) miss that. Further with the explosion of job titles, and the fact that in small companies on manager can wear a lot of hats makes the job search really an exercise in listing keywords, and not qualifications. Some years ago, just to screw the system, I searched out the keywords and phrases utilized by the brain-dead tools, and listed them all alphabetically as the last page of my resume. Dozens of calls a day, about 80% for jobs at 1/2 or less of my salary from the HR autobots who hadn’t bothered to read the resume, or if they did, had no idea what was being said. Not a loss – because any company utilizing this sort of tool to recruit executive level candidates, is so effed up even if you take the job – the problems are so massive, you can’t fix it. 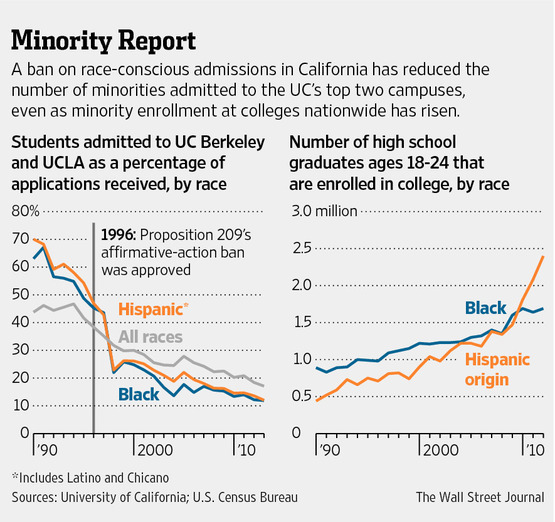 Lastly, the problem with the West Coast companies in terms of hiring qualified black engineers and managers is twofold. One, the tend to hire from each other, meaning the same group of mostly white and Asian folks just circulate, and two – due to re-segregation legislation like Prop 209 in California…There are very few black or Hispanic graduates in the STEM Field on the West Coast. The are, however plenty graduating from universities on the East Coast, which wasn’t infected by that Ward Connerly racism disease. Second issue is getting those grads to move to the “left coast”, into a corporate and community environment which may be hostile. Not saying there is hostility – but I’m just sayin’ most black folks feel a little more comfortable, when there are more black folks walking around than would commonly be found on the streets of Sydney Australia. Especially when you consider that the majority of black STEM degree holders are coming from HBCUs. Here is the case of Twitter…Which I would estimate derives about 30-40% of their Tweets from black folks. The company no longer has any African-Americans in engineering leadership positions, the former Twitter employee says. 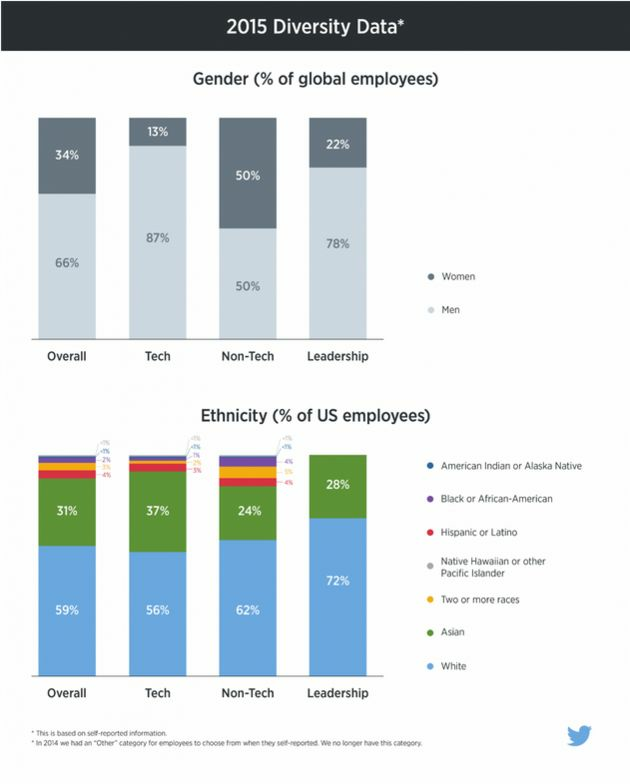 Twitter say it’s committed to creating a more diverse workforce, but, like the rest of the tech industry, it has yet to succeed. This week, a former employee offered a glimpse into the beleaguered microblogging company’s struggle to be more inclusive. “With my departure, Twitter no longer has any managers, directors, or VP’s of color in engineering or product management,” Twitter Engineering Manager Leslie Miley wrote on Medium on Tuesday. Miley was among those laid off from the company in October, although he made clear his intention to leave before the company announced the cuts, according toTechCrunch. There are few African-American or Latino employees in any part of the company — and none at the top, according to the company’s own diversity data, released in August. This, however, is not just a Twitter problem. It’s a tech industry problem, as Miley noted in a separate post, written earlier in October, about diversity in his field. Miley presents a theory as to why this is the case: It’s about pattern matching. Successful people think future successful people are going to look like them (or the people they see around them). When a company hires for a specific pattern, it’s not a surprise that everyone begins to look the same. This shows up in recruiting organizations targeting specific schools, employee referrals, and promotions of like minded individuals. Yahoo > Google > LinkedIn > FaceBook > Twitter. After Yahoo each of these companies’ diversity numbers have been worse than the company that followed them. I believe this is because Google recruited from Yahoo, LinkedIn from Google, and so on. Each subsequent company becomes less diverse due to the sub-conscious amplification of educational, cultural and work history biases. Actually have a picture of my Mom teaching in one of these old schools with a potbelly stove to heat the classroom… And that was in the early 50’s. This isn’t it. The right absorbs racism from many of their right wing Internet sites. One of their favorite topics is black crime. The second is interracial crime claiming that white folks are under attack by black folks. All with numbers from seemingly unimpeachable sources such as the DOJ Annual Crime Reports. Since about 1992, when Dinesh D’Souza and white supremacist Jared Taylor published their books – this (mis) information has been rattling around Internet, and taken as Gospel by many conservatives. The National Review is one of the right wing publications with a less than sterling reputation in terms of it’s writers spewing racism. Manning the racism desk there are several folks, among them Heather McDonald, who spew virulent racist crap for a living. Let’s look at those numbers which she got off one or the other white supremacist site…. In 2012, blacks committed 560,600 acts of violence against whites (excluding homicide), and whites committed 99,403 acts of violence (excluding homicide) against blacks, according to data from the National Crime Victimization Survey provided to the author. Blacks, in other words, committed 85 percent of the non-homicide interracial crimes of violence between blacks and whites, even though they are less than 13 percent of the population. Now assuming she didn’t lie about the overall statistic (which is probable)…There are 6.2 white folks for every black person in this country. Ergo a black person is 11x (2485/226 = 10.99) more likely to have a violent crime committed against them by a white person than vice versa. And THAT is why the DOJ and FBI ALWAYS express their numbers in terms of rate per 100,000. What McDonald is done is standard white supremacist trickery, by lying about how the numbers actually work and ignoring the population differences. Now – the white nationalist sites the author is quoting depend on existing white predilection to racism, poor intellect, or pure stupidity to sell their tawdry racist wares. And McDonald is a racist POS for repeating this crap, when if she had an IQ above table salt she would have known better. The National Review apparently supports this. And she repeats the various versions of the white racist song over and over in virtually every article she writes. Dylann Root was recruited by the same sort of numerical trickery – which is the objective of promoting this sordid racist propaganda. Clark says that the ad has been “really, really successful” — but that out of the “well over 200 or 300 applications” that the listing had yielded so far, not everyone’s making the cut. “There’s 70 to 75 percent that I would say are not qualified for an office of that caliber,” he says.